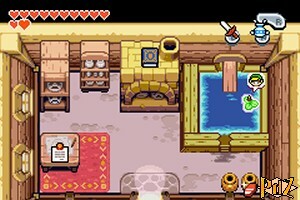 Play your ocarina to be carried by the bird Zeffa and choose Lake Hylia as your destination. Shrink on the stump and get in the Minish's house. Talk to him and following his advices, go back to Hyrule Town (by playing your ocarina). Go northwest and enter the house with the blue plate above the door. Speak to the workers, then go to the first floor and talk to the elder. Get out, flip the vase thanks to your Cane of Pacci and shrink. 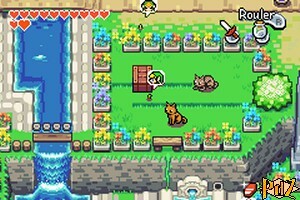 Go back inside and talk to the Minish next to the elder. Then go back to your normal size and speak to the employees again to know who took one of the books. Get out and get in the house of the kitten lady, southeast of the city. Read the letter on the table and notice the book on the bookshelf. Get out, go find some water to put in your bottle, then get in the next house. Pour the water in the fireplace to the right, then flip the vase and shrink. Get in the fireplace, go to the girl's house, then climb the small ladder, go on the bookshelf and push the book to make it fall down. 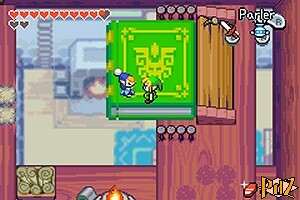 Go back to the neighbour, go back to your normal size, go to the girl's house and pick up the book "A Hyrulian Bestiary"! Go back to the library and speak twice to the worker on the left to give him back the book and to know the name of the next owner. Get out, refill your Bottle again, then go to the café south of the town and shrink thanks to the vase. Get out from the small hole, go west and cross the river thanks to the small plank. Go on to the north and talk to the dog blocking the stairs. Return to the café and go back to your size. Then go northwest of the town, then south and go down the stairs that the dog freed. Get in the house on the left and talk to Dr. Left. Pour the water in his fireplace, then get out and get in the house on the right. Shrink, get out from the hole to the north and go back to Dr. Left's. Go through the small hole and talk to the Minish that will tell you about a treasure. Get out from the fireplace, then get in the house with the yellow rooftop. Speak to the Minish, then get out, go down, cross on the small plank and talk to the next Minish. Go through the park while avoiding the cats, go down the small vine, then get in the hole on the side of the fountain. You will now be in a small dungeon. Go right, use the Cane of Pacci on the hole, jump and go up. Get rid of the four enemies, then pick up the Power Bracelet from the chest. Go left, leave the small dungeon and go back to Dr. Left's. Push the left wardrobe to the left, then the other one the same way. Climb the small ladder, go right and get in the hole. 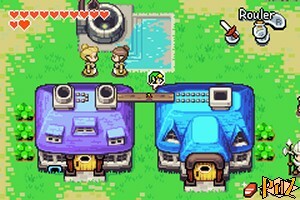 Talk to the Minish on the right, then dust around with your Gust Jar and create a clone on the slabs to the left. Go back on the book that will fall thanks to the weight of three people. Get out from the bottom, go back to the workers' place to go back to your normal size and pick up the fallen book: "The legend of the Picori". Go back to the library and speak to the employee to give back the book and get information about the third book. Go to Hagen's to the east of the town and speak to him. 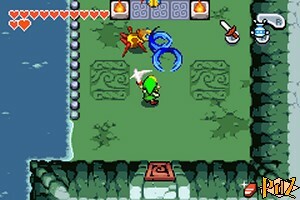 Wear your Pegasus Boots and run into the wall to make all four masks fall, then shrink thanks to the vase. Climb the small ladder and go through the hole. Talk to the Minish, go back to your size and get out. Go to the Minish Woods from the north entrance and head to Syrup's shop. Before climbing the stairs, go right and use the Mole Mitts to get into the cave. Dig to the north and climb the ladder, then go right and get into the house. Read the letter on the table, get out, go behind the house and run into the tree with your Pegasus Boots. Get on the stump, shrink and go straight to the house. Climb on the water lily and cross the water with your Gust Jar. Inside, use the small water lily, then push the wardrobe to the right and climb the ladder. Make the book fall, then backtrack to go back to your normal size. Go back in the house and pick up the book: "A History of Masks". Get out, go back to the library and bring back the last book. Go to the second floor, shrink on the vase outside and go back to the elder. Speak to the Minish that will give you 50 rupees then climb on the edge of the blue book, then the red book and the green book. Go right, go down along the red book's edge and get in the green book. Talk to Librari who will send you to the Water Temple! Push the blocks and go down. Vacuum the toadstool to go across, break the pots to get some hearts and go up. Fight the two monsters by hitting them with your sword on their back or their sides, then open the chest and get the Flippers! Swim down to exit the dungeon, then go back on solid ground and go back to your normal size. Play your ocarina and choose once more Lake Hylia. Go north, then go down the stairs, swim to the east, south, west and north towards some kind of iceberg. Climb on it and shrink to reach the next temple.